The standard image size for the Office toolbar icons is 16x16. However, you can change settings to display icons in large mode 32x32 (see below). To get more information on Icons and image sizes , we recommend you to read this topic: What is an Icon? 1. Choose File/New/Icon Project or press Ctrl+N. A new dialog box opens. Axialis IconWorkshop supports both Windows and Macintosh icons (see format comparison to learn more). 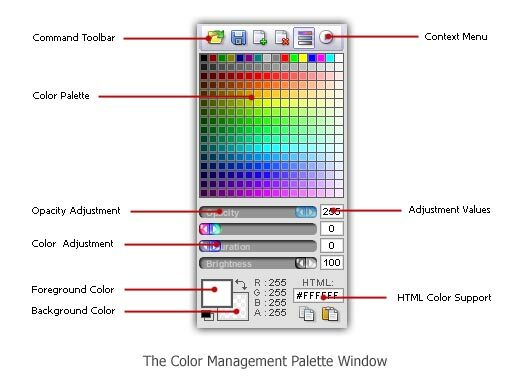 We'll use a Windows icon in this tutorial. 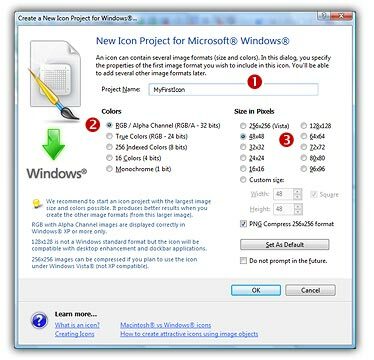 Select the Microsoft Windows Icon Project option. Click OK, another dialog box opens. 2. In the Project Name edit zone ( ), enter any icon project name. Do not specify an extension. 3. 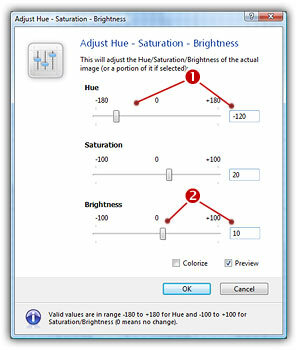 In the Colors group ( ), select: XP with Alpha Channel (RGB/A - 32 bits). This format uses an additional Alpha Channel to create smooth shades and object borders (see what is an icon to learn more). 4. 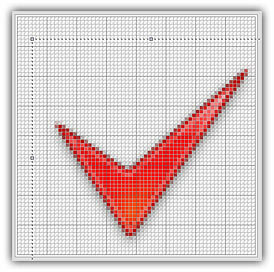 In the Size in Pixels group ( ), choose: 64x64. This is easier to draw a large image then create the other image formats from this one. Additionally, the smaller formats will be created with better results (shrinking an image always produces better results). Click OK, the dialog box closes and a new icon document is created. 10. Choose "Draw/Add Text (Ctrl+T)". 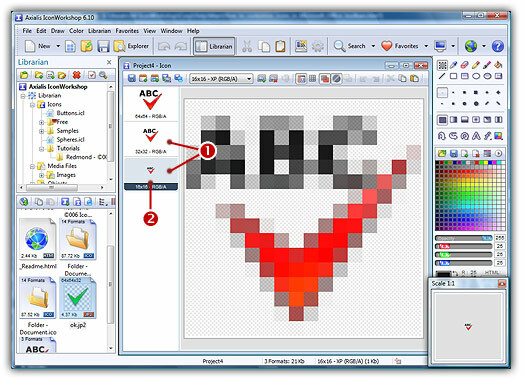 In the dialog box (see below), type the text "ABC" ( ). 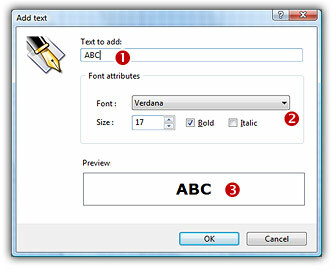 In Font Attributes group, select "Verdana", size 17, Bold ( ). The preview should be as shown below ( ). 12. In Microsoft Office toolbars, only formats 16x16 or 32x32 are used. So, let's create these 2 formats from the actual image we've just made. This is done in one step with IconWorkshop Corporate Edition (if you own the personal edition, create the other formats individually). Right-click on the image we've just created in the list (see above). 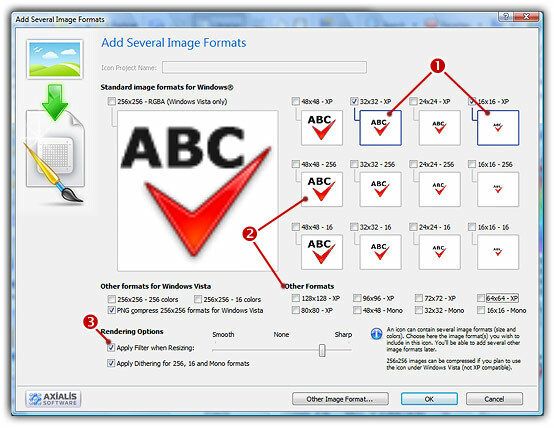 A menu opens, select "Add Several Image Formats from this Image". 14. When done, click OK. The new formats have been added to the icon project (see below). Now we recommend you to save your work in a permanent file ICO file. If you want to verify your work, the icon can be opened in the Librarian folder "Icons/Tutorials/Spelling.ico". 15. Select the icon format you wish to use for the Office toolbar customization. In our case we need the 16x16 format (see above ). 16. In the menu, choose "Edit/Copy". 17. Start the Microsoft Office application that you want to customize. In this tutorial, we'll customize the "Spelling and Grammar" button of Word. So let's launch Microsoft Office Word. 18. Once the Word application is opened, be sure the toolbar "Standard" is displayed. If this is not the case, right-click in any toolbar and select "Standard". Now the toolbar is displayed. 19. In the menu of Microsoft Word, choose "Tools/Customize". A dialog opens but we won't use it directly. Once this dialog is opened, a special menu is accessible when you right-click on any button of the toolbars displayed in the program (NOT in the dialog box). 21. Close the dialog box "Customize". You're done! The button image has been updated ( ), congratulations! 1. In the Office menu, select "Tools/Customize". A dialog box opens, select the "Options" tab. In "Other" section select "Large Icons". 2. All the toolbars switch automatically in large 32x32 mode. The problem is that the icons are displayed in a 16x16 zoomed format, not in native 32x32 resolution which is not very nice! 3. 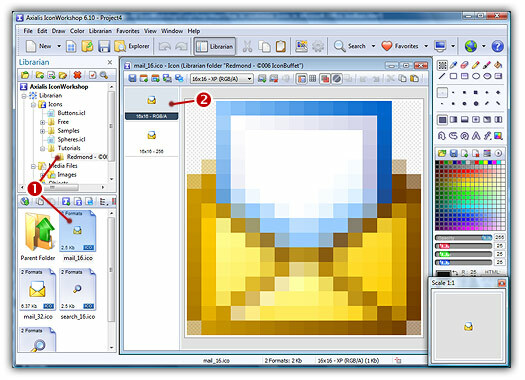 To get slick button images, restart from step 15 above and select the 32x32 image format in IconWorkshop. The result should look like shown below ( ). Much better! Usually these sets are limited but additional custom icons can be created by adding overlays or objects to the icons of the set. 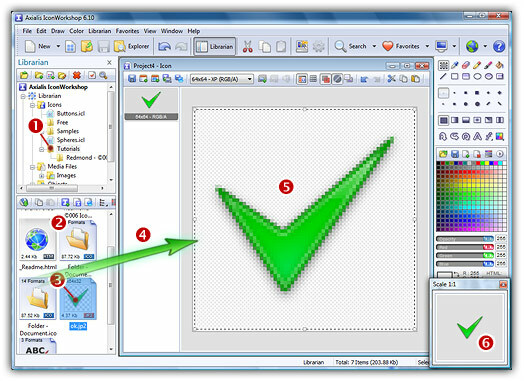 This is easily done with IconWorkshop using drag-and-drop (see step 5 above). Many companies on the web now propose Stock Icons. 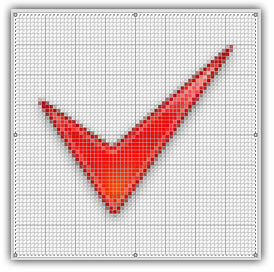 In the following procedure, we're going to replace the "e-mail" button image of Microsoft Word by the "Mail" icon from IconBuffet "Redmond" icon set. The icons from IconBuffet (Firewheel Design Incorporated) are included in the IconWorkshop package for demo/tutorial purpose only. You cannot use these icons for any other purpose. Icons are included in the package with IconBuffet permission. Icons are copyright IconBuffet. 1. Open the Librarian window, go to the folder "Icons\Tutorials\Redmond - ©2006 IconBuffet" and double-click on the icon "mail_16.ico" in the list below ( ). 3. In the menu, choose "Edit/Copy". 4. Start the Microsoft Office application you want to customize. In this tutorial, we'll customize the "email" button of Word. So let's launch Microsoft Office Word. 5. Be sure the toolbar "Standard" is displayed. If this is not the case, right-click in any toolbar and select "Standard". 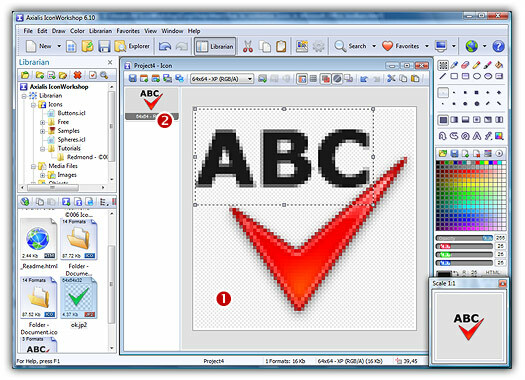 The toolbar is displayed. 6. In the menu of Microsoft Word, choose "Tools/Customize". A dialog opens but we won't use it directly. Once this dialog is opened, a special menu is accessible when you right-click on any button of the toolbars displayed in the program (NOT in the dialog box). 7. Right-click with the mouse on the toolbar button "email". 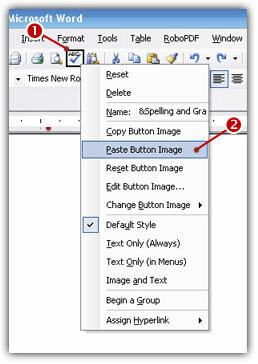 A menu opens, select "Paste Button Image". 8. If you want to practice, do the same by replacing the "Research" Word button image by the "search_16.ico" icon from IconBuffet. Also, 32x32 versions are available if you want to test the resulting quality in large toolbar size.